Brad Setser argues that the U.S. is borrowing far less from the world now than at this time last year, and that more government borrowing doesn’t always equate more total borrowing. 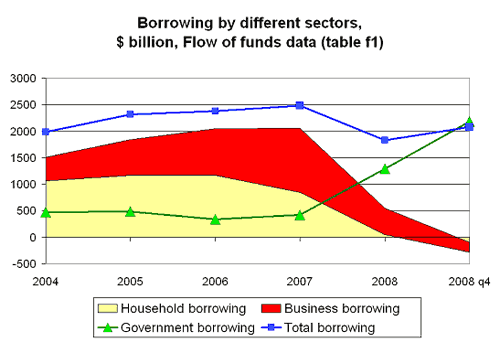 Why hasn’t the expansion of the fiscal deficit pushed the amount the US borrows from the world up? Simple. American households and businesses are borrowing a lot less, so the total amount of money that Americans are borrowing isn’t rising. It would be quite productive if we could have a higher savings rate and a smaller deficit on the current account. A higher savings rate would allow for an increase in investments in private capital along with our investment in public capital, consequently prompting an increase in productivity. That way we don’t have to rely on massive borrowing from abroad.